These highlights do not include all the information needed to use FEMARA safely and effectively. See full prescribing information for FEMARA. The most common adverse reactions (greater than 20%) were hot flashes, arthralgia; flushing, asthenia, edema, arthralgia, headache, dizziness, hypercholesterolemia, sweating increased, bone pain; and musculoskeletal (6). â— Pregnancy: Letrozole can cause fetal harm [see Use in Specific Populations (8.1)]. â— Known hypersensitivity to the active substance, or to any of the excipients [see Adverse Reactions (6)]. 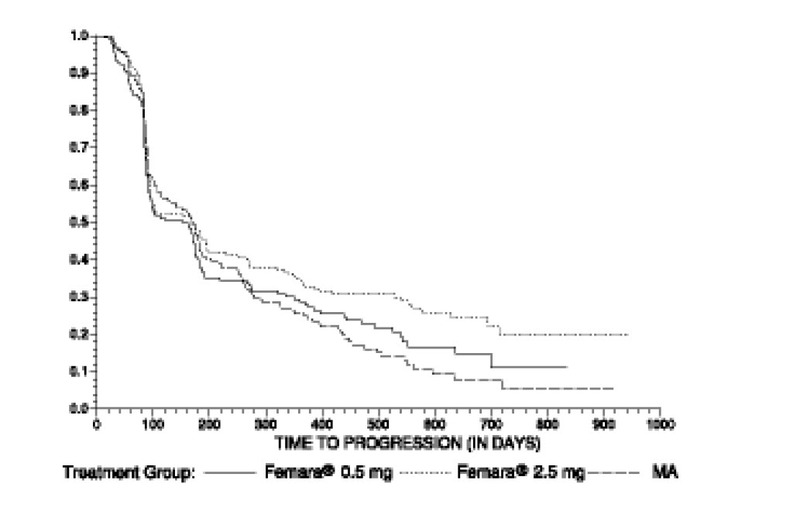 Based on post-marketing reports, findings from animal studies and the mechanism of action, Femara can cause fetal harm and is contraindicated for use in pregnant women. In post-marketing reports, use of letrozole during pregnancy resulted in cases of spontaneous abortions and congenital birth defects. Letrozole caused embryo-fetal toxicities in rats and rabbits at maternal exposures that were below the maximum recommended human dose (MHRD) on a mg/m2 basis. Advise pregnant women of the potential risk to a fetus. Advise females of reproductive potential to use effective contraception during therapy with Femara and for at least 3 weeks after the last dose [see Adverse Reactions (6.2), Use in Specific Populations (8.1, 8.3) and Clinical Pharmacology (12.1)]. 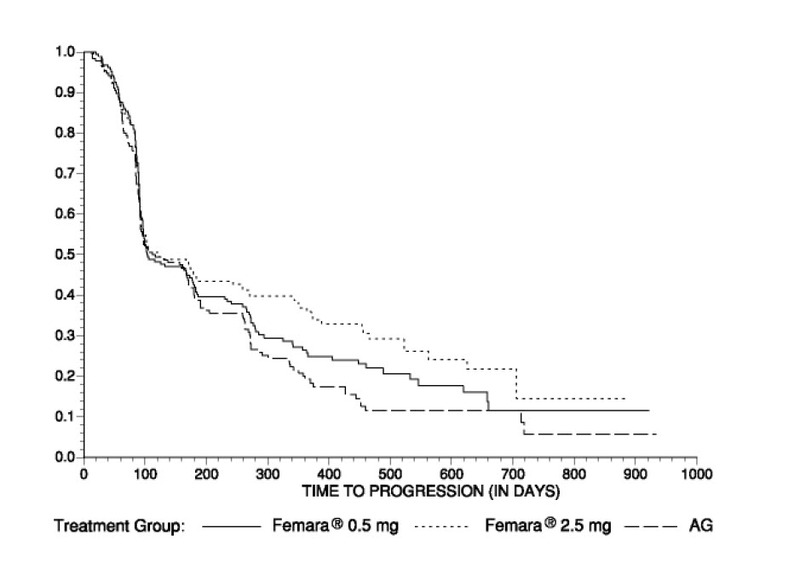 Comparisons of the incidence of adverse reactions revealed no significant differences between the high and low dose Femara groups in either study. Most of the adverse reactions observed in all treatment groups were mild to moderate in severity and it was generally not possible to distinguish adverse reactions due to treatment from the consequences of the patientâ€™s metastatic breast cancer, the effects of estrogen deprivation, or intercurrent illness. 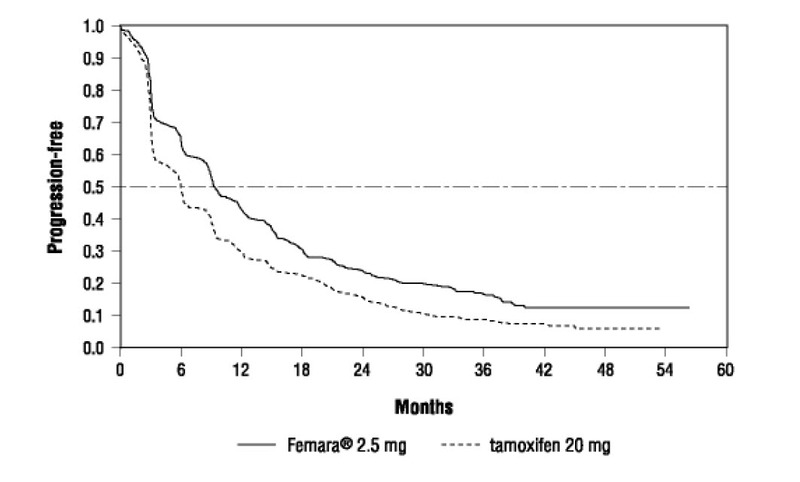 In a fertility and early embryonic development toxicity study in female rats, oral administration of letrozole starting 2 weeks before mating until pregnancy day 6 resulted in an increase in pre-implantation loss at doses â‰¥ 0.003 mg/kg/day (approximately 0.01 times the maximum recommended human dose on a mg/m2 basis). In an embryo-fetal developmental toxicity study in rats, daily administration of oral letrozole during the period of organogenesis at doses â‰¥ 0.003 mg/kg (approximately 0.01 time the maximum recommended human dose on a mg/m2 basis) resulted in embryo-fetal toxicity including intrauterine mortality, increased resorptions and postimplantation loss, decreased numbers of live fetuses and fetal anomalies including absence and shortening of renal papilla, dilation of ureter, edema and incomplete ossification of frontal skull and metatarsals. Letrozole was teratogenic to rats at a dose of 0.03 mg/kg (approximately 0.01 times the maximum recommended human dose on a mg/m2 basis) and caused fetal domed head and cervical/centrum vertebral fusion. 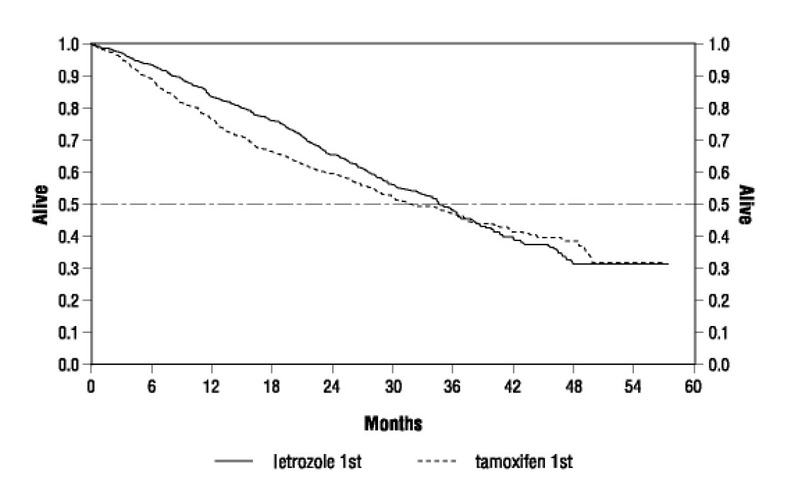 In the embryo-fetal development toxicity study in rabbits, daily administration of oral letrozole during the period of organogenesis at doses â‰¥ 0.002 mg/kg (approximately 0.01 times the maximum recommended human dose on a mg/m2 basis) resulted in embryo-fetal toxicity including intrauterine mortality, increased resorption, increased postimplantation loss and decreased numbers of live fetuses. Fetal anomalies included incomplete ossification of the skull, sternebrae, and fore- and hind legs. Absorption and Distribution: Letrozole is rapidly and completely absorbed from the gastrointestinal tract and absorption is not affected by food. It is metabolized slowly to an inactive metabolite whose glucuronide conjugate is excreted renally, representing the major clearance pathway. About 90% of radiolabeled letrozole is recovered in urine. 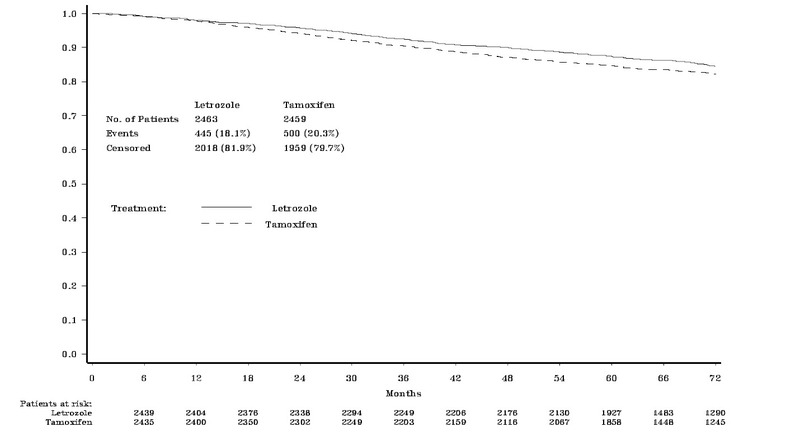 Letrozoleâ€™s terminal elimination half-life is about 2 days and steady-state plasma concentration after daily 2.5 mg dosing is reached in 2-6 weeks. Plasma concentrations at steady state are 1.5 to 2 times higher than predicted from the concentrations measured after a single dose, indicating a slight non-linearity in the pharmacokinetics of letrozole upon daily administration of 2.5 mg. These steady-state levels are maintained over extended periods, however, and continuous accumulation of letrozole does not occur. 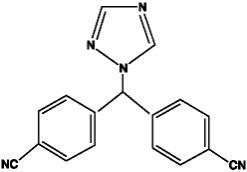 Letrozole is weakly protein bound and has a large volume of distribution (approximately 1.9 L/kg). In a fertility and early embryonic development toxicity study in female rats, oral administration of letrozole starting 2 weeks before mating until pregnancy day 6 resulted in an increase in pre-implantation loss at doses â‰¥ 0.03 mg/kg/day (approximately 0.1 times the maximum recommended human dose on a mg/m2 basis). In repeat-dose toxicity studies, administration of letrozole caused sexual inactivity in females and atrophy of the reproductive tract in males and females at doses of 0.6, 0.1 and 0.03 mg/kg in mice, rats and dogs, respectively (approximately 1, 0.4 and 0.4 times the daily maximum recommended human dose on a mg/m2 basis, respectively).